1. If you want to speed up your success – invest in your business. I signed up for a very expensive business coach right out of the gate. My business friends thought I was crazy – but as an entrepreneur, I know that you need to invest in a business up front in order to succeed. By making the investment early, I saved years of trial and error. I had a coach who had traveled the road I was traveling, and was instantly a member of a peer group of business owners who were further along than I was. I think that there is a big misconception that you can start a successful online business “for free”. I haven’t ever seen it happen. Most of my clients come to me after years of struggle. I help them cut years off the growth curve. By investing early – you can make money faster. Click here for the story of the risk I took in order to meet my first coach. Would you trust a dentist who answered their own phone, checked you in, and put all your insurance details in the computer? What if you saw them emptying the trash right before your appointment? You would probably guess they were a brand new dentist (or an intern) and run the other way. Your clients are hiring you to coach them on how to create a successful business. They are not hiring you to design their websites for them. Why waste time learning those skills when you should be spending time building relationships and honing your coaching skills? It also pays to actually “pay” your team. I know that expenses can mount when you are just starting out, but I have found that you get what you pay for. You shouldn’t overspend, but getting help for a tiny amount of money means that you spend more time managing your team. My current team consists of experienced business owners who add value when they work together. Having a dependable team will make your job much easier. Click here for my best advice on where to start creating a team in your business. 3, Building a coaching business is all about building relationships and relationship building takes time. My first year of business, I made less than $12,000 and all of that (and more) went to paying my team. At the time, I was afraid to show my face at family dinners. I come from a family of very successful entrepreneurs, and it felt like I was failing. You see, what I didn’t realize until later was that the foundation of your business is the relationships you build – your community. I have seen it again and again. Clients struggle their first year in a new business. It seems like they are putting in a lot of effort and not getting anywhere. It is really tempting to give up, get a job or move on to the next big idea. The thing is, that growth is a hockey stick not a diagonal line. My clients who put in the time to develop the relationships see their businesses “leap”. The Internet makes it easy to build relationships, but nothing takes the place of getting out of your house and attending live events. If you don’t live in a big city, travel. Yes, it can be expensive and hard to get away, but the face to face time makes it worth it. 4. There is a path to success – you must commit to it and be careful about getting really sidetracked. The details may change slightly and your commitment of time to the plan will make it work. As anyone on my team will attest, I am not a very techie person. I have a natural gift for creating strategy that works for clients, but I have no idea which buttons to push to make any of it happen. Changing course for me is expensive. I have to pay designers, copywriters, web designers, event planners to make big changes happen. This has turned out to be a good thing. I have clients who are very technically gifted. They can change directions on a dime. The problem is, they don’t stick with the plan. It is easy to get sidetracked – if you get sidetracked, you end up going nowhere. 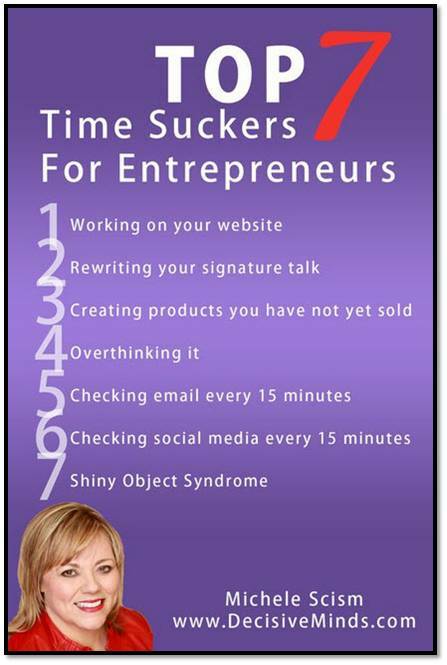 Click here for my 7 biggest time wasters. If you had asked me before I started coaching if mindset was important, I probably would have said no. I believed that if someone had a solid plan, and sticks with it, they will succeed. What I’ve learned after 6 years of coaching is this. You can’t be successful as a solopreneur if your mind is in the wrong place. If you don’t believe you can succeed, then you really won’t. The best strategy in the world, won’t save your business if our head is not in the game. This is why I partnered with a mindset coach to help my business strategy clients. You really need to have both. 6. The technology changes – but the fundamentals of success stay the same. Meerkat, Periscope, Blab, Click Funnels. Technology online is constantly changing. If you have worked online at all, you know that there is a new “must have” technology every week. You can spend a lot of time and money keeping up with all that is new. You don’t need to. The formula for business success, know your customer, build a relationship, and solve their problem remains the same no matter what technologies you are using to get your message to your audience. Want a more depth plan? I lay it all out for you in my book Take the Risks for Get a Job. What are the biggest lessons you’ve learned in your business so far?